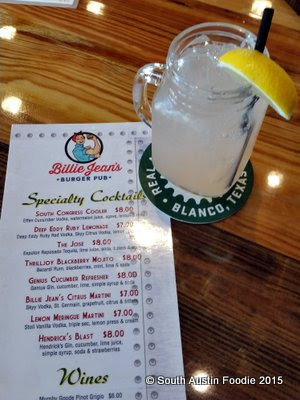 A couple weeks ago, I met a friend for happy hour at the relatively new Billie Jean's Burger Pub. They opened at the end of May, and were barely a blip on my radar until I saw another friend post their huge wedge salad on Facebook. Can I let you in on a secret? 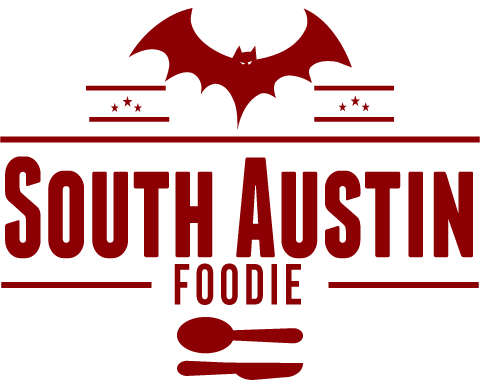 I think they are a hidden gem, literally hidden behind the road construction at 6501 South Congress just north of the light at William Cannon. Walking in at 5 pm, there was little business at Billie Jean's, but it gave me a moment to take in the space, which is light-filled thanks to huge windows. There's a bank of booth seating to the right, four-top tables in the middle, and a nice-sized bar on the left. I plopped down at the bar where the only other patrons in the whole place were also seated. The friendly female bartender brought me menus, and my friend arrived shortly thereafter. Happy hour runs Monday through Friday, and I had their hard lemonade, which was fairly hard (no complaints!). We split a basket of Rosie's Fries, which quite basically, were amazing. 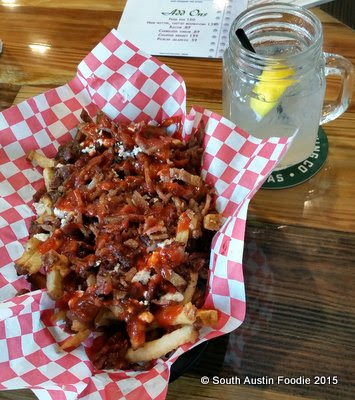 Hand cut fries with caramelized onions, goat cheese, bacon, and sriracha. I've been singing their praises and dying for these ever since. 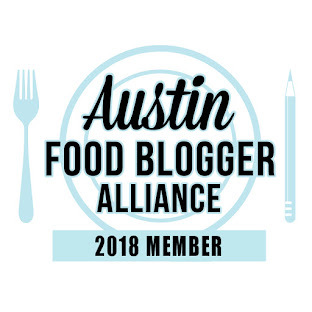 The name I would guess is a nod to their Rosie the Riveter-inspired logo, and the two women who started Billie Jean's as a food trailer. Nicely done, ladies! 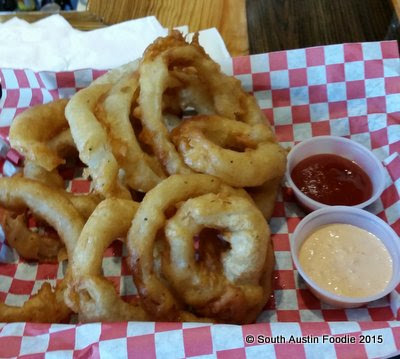 Another friend came and joined us, and he wanted onion rings, so we ordered those. They were good, but not as much to my liking as the fries. Funny, I had two people say to me, as I was showing them the food pics on my phone, "I don't like tempura style onion rings." And they're right, that's exactly what these were, and I definitely missed all the little crunchy bits on onion rings that fall off everywhere. These weren't bad at all, just a style preference. So now being fairly well-stuffed on fries and rings, none of us were particularly hungry, but I didn't feel that we should pass up the opportunity to try their burgers. We had seen some HUGE burgers come out of the kitchen, and the place was starting to fill up. 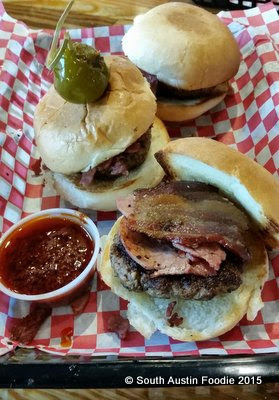 They do have a slider option on the menu, where you get three sliders with your choice of two meaty toppings; we picked corned beef and bacon. It was a tasty burger though a bit dry (but that's often the case with sliders), and the side of harissa was particularly yummy. Their burgers are always made fresh from Angus beef, and never frozen. I would like to go back and try one of their regular burgers, and I am hearing a lot of buzz about their Moroccan. And that wedge salad still tempts me! Heck, even the tofu black bean burger sounds good! People are able to find Billie Jean's through the ongoing road construction, as there was a good crowd when we left. Great addition to that part of town, and really look forward to going back! Sad that it's gone. The food and staff were a great addition to this part of town. Unfortunately the seemingly endless (though recently completed, finally) road construction along with the empty neighboring spaces didn't lend itself for it to succeed. That's too bad. I know, I recently heard they had closed, which is really too bad. Guess I should update this post!